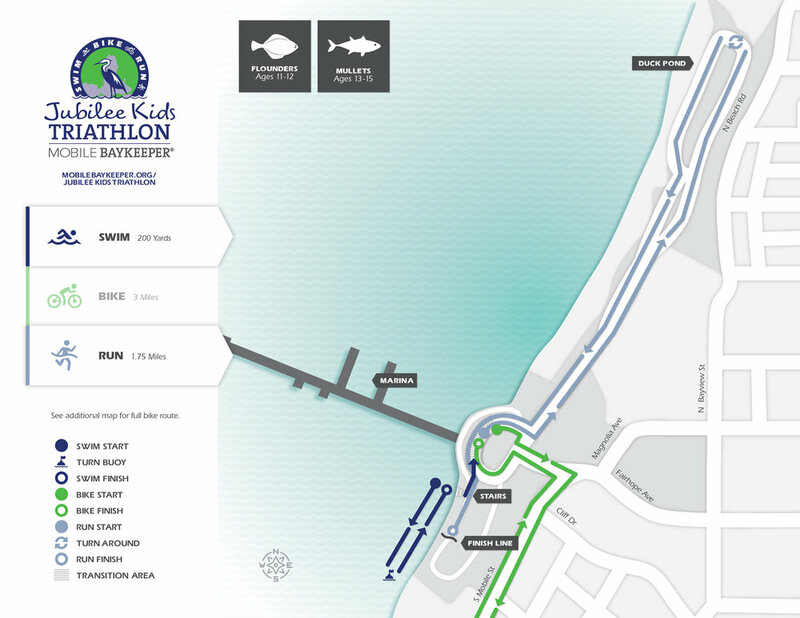 Above: Course map for Flounders & Mullets (Racers ages 11-15). Click to enlarge. Design by Graves Creative. Important Note: Transition Area for Ages 11-15 has changed to the Bay side of the Rose Garden to match the transition area of the Grandman Triathlon. Swim Course (Starting time – 7:30am): Racers will begin the race on the beach on the South side of the Fairhope Pier and will start the swim course by age group, with the oldest age group going first. Wave 1 will be racers ages 13-15 (Mullets). They will begin at 7:30 a.m. Wave 2 will consist of racers ages 11-12 (Flounders) and will start at approximately 7:33 a.m. All racers in this division will swim out 100 yards from the shore to the turnaround point and return the opposite direction, swimming 100 yards back to the shore. Above: Bike course map for Mullets & Flounders (Racers ages 11-15). Click to enlarge. Map design by Graves Creative. 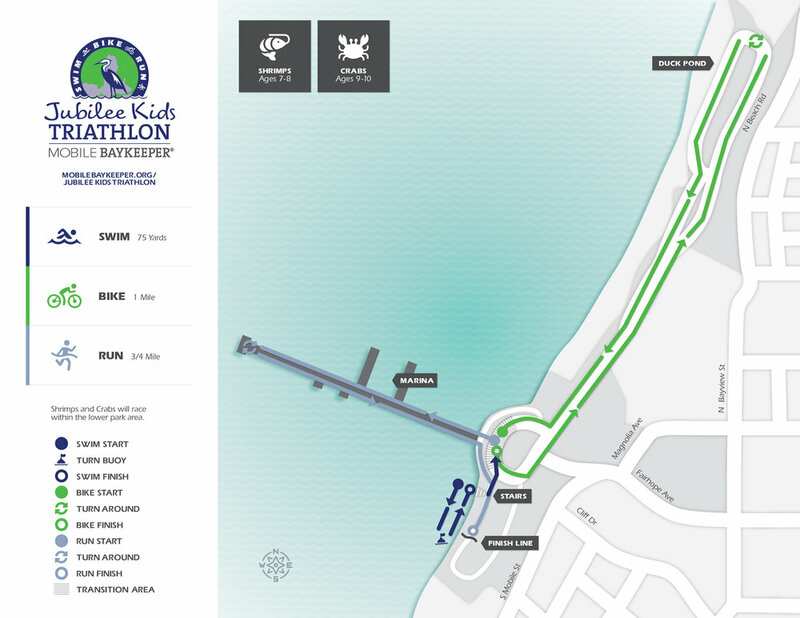 Bike Course: Racers will exit the swim and head to the transition area and collect their bike. Racers will then walk their bike up the hill and begin the bike course at the top of the hill. Racers will head South on Mobile St. and bike 1.5 miles to the turnaround point at Sweetwater Circle, before returning 1.5 miles headed North on Mobile St. Once racers have returned, they will dismount their bicycles at the top of the hill and walk down to the transition area. Run Course: Following the bike, racers will begin the run course. Racers will run North on N. Beach Rd. to the turnaround point and return the opposite direction, completing the 1.75 mile run at the finish line at Fairhope Pier Park. Approximate Start Time: 7:45 a.m. Above: Course map for Shrimps & Crabs Divisions (Racers ages 7-10). Click to enlarge. Map design by Graves Creative. Swim Course: Racers in this division will begin the race after the last racer from the oldest age group completes the race, lining up on the beach located on the South side of the Fairhope Pier. Racers ages 9-10 (Crabs) will be Wave 3 and begin the swim at approximately 7:45 a.m. Wave 4 will consist of Racers ages 7-8 (Shrimps) and will begin the swim at approximately 7:48 a.m. All racers in this division will complete a 75-yard swim, beginning at the shore before swimming out to the turnaround point and swimming back to the shore and moving to the transition area. Bike Course: Racers will head to the transition area to begin the bike portion of the race. Racers in this division will remain in the lower park area for the bike course, riding North ½ mile up N. Beach Rd. (the Duck Pond) to the turnaround point and riding ½ mile back to the transition area. Run Course: Racers will return to the transition area and begin the run course. 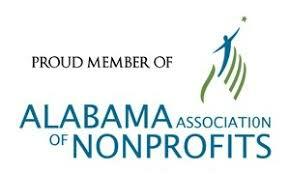 They will exit the transition area and run West – out into Mobile Bay on the Fairhope Pier to the turnaround point, before heading back the toward the transition area and completing the 0.75 mile run at the finish line at Fairhope Pier Park. Transition Area: There will be one entry into the transition area and one exit to the transition area. 1. Transition area will open to racers at 6 a.m.
2. Only body-marked racers will be allowed into the transition area. 3. Transition area will close at 7:15 a.m.
4. Transition will re-open at 9 a.m. when the last cyclist finishes the race. Only five racers are allowed into the transition area at one time to gather their belongings while racers are still on the race course. Once the last racer has crossed the finish line, the transition area will open. 5. Racers’ bike number must match the body marking number to exit the transition area. 8. If you need something important to your health and safety (such as medicine), please leave it at the information tent with a medical officer.